My Kind of Town | So Many Exciting and Beautiful Places! After breakfast, several of us headed to the lake shore for a short walk. In the distance, we could see the Ferris wheel at Navy Pier. This Ferris wheel was installed in 1995, and measures 150 feet in height. Tomorrow, it will be dismantled to make way for a larger (about 50 feet taller), high tech wheel with 42 gondolas. 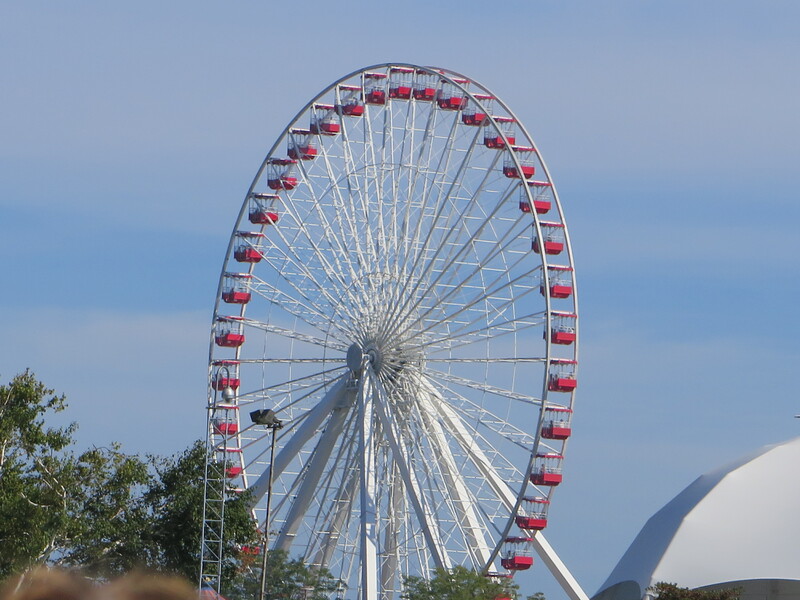 This new wheel will be installed as part of Navy Pier’s centennial celebration. It was free to ride this weekend, and an estimated 30,000 people rode. To accommodate the many visitors, it remained open overnight on Saturday. The original Ferris wheel, which measured 264 feet, was named for George Washington Gale Ferris, Jr., was designed and constructed for the 1893 World’s Columbian Exposition in Chicago at Jackson Park, about 9 miles south of Navy Pier. Some of the group went back to the Art Institute, and others visited the Museum of Contemporary Art, another place where I could spend more time. The gift shop was a hit as well. Among our purchases were purses, jewelry, cards, hats, and sets of “hands.” These were finger “puppets,” and Donna demonstrated one potential use for them. Donna arm wrestles with herself. Next stop was a designer consignment shop. No one had any luck there. Then, lunch at Bijans Bistro, followed by more exploring and/or shopping. The city does a beautiful job of incorporating green spaces and art into the downtown landscape. It’s a welcoming environment where you can see people of all hues and hear languages from around the world. Dinner tonight was at Bistronomic, located just a couple of blocks from the hotel. Delicious meal, once again. I don’t think there were any disappointing meals during this trip. I was exhausted by the end of this day. I do wish you could have joined us. It was a wonderful time.